I'm so glad to have Carol Alexander back as a guest poster, this time about homeschooling! Check out her information below, and be sure to head to her blog! When I got my first seed catalog in the mail this year I was really excited. Not just because I get anxious to get my hands in the dirt. But because of all the school assignments that come in those catalogs. What? You’ve never seen all the wonderful school curriculum hiding in your seed catalogs? Well, let me introduce you to a few assignments. On the front of my Gurney’s catalog is a giant coupon that reads: “Good for $25.00 worth of products in this Gurney’s catalog when you buy $25.00 or more of additional products at the catalog price.” Have your child go shopping in the catalog. Using the order form found between pages 32 and 33 have him “order” $50 worth of product, figuring the totals, the tax, the discount, and the shipping. If you get $25 free off of a $50 order, what percentage is that? One ounce of summer squash seeds contains about 225 seeds and sows a 100 ft. row. If you get 25 seeds in a packet for $3.99 or ½ oz. of seeds for $12.99, which is the better deal? If you want to sow 300 ft. or row, how much will the seeds cost you? See the customer reviews in the shaded green boxes on the pages of the catalog? Have your child write his own review of his favorite vegetable. Have your child write some ad copy describing his favorite fruits, flowers or produce. Here are some vocabulary words: hybrid, lumina, vigorous, unique, exotic, Latino, resistant. I’m sure you can find a lot more! See all the sprout seeds on page 29? Grow sprouts at home. There’s no better way than to learn the science of growing plants. Do a research project on Gregor Mendel and his work pertaining to hybrid plants. When your garden is in full beauty, sketch plants, flowers, and fruit in your nature journals. Discuss and approach the challenges of photographing produce in the garden as well as on the table. Create three recipes using fresh fruits or vegetables from the homestead. Learn to cook and eat three new vegetables this summer. This is just a sampling. You can get more than 50 lesson plans using your seed catalogs from my e-booklet Seed Catalog Curriculum. This e-booklet is full of ideas to use with elementary, middle, and upper-grade children. You can use any catalog. In fact, the more the better. Plus, I give you the names and contact information to order your own...if you don't already receive them in the mail. Start integrating your homesteading with your homeschooling now. 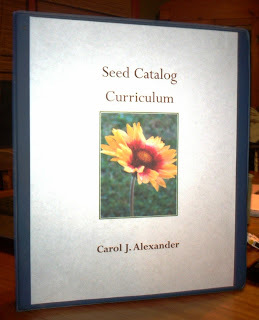 Buy Seed Catalog Curriculum and you will see how easy it really is. It's only $3.99! Just click here for more information. Freelance writer and mom of six, Carol J. Alexander writes about homeschooling and homesteading from the Shenandoah Valley of Virginia. Her articles have appeared in BackHome Magazine, Grit, Urban Farm, Home Education Magazine and various Regional Parenting Publications. Visit her blog http://everythinghomewithcarol.blogspot.com/.